Happy Vegan Friday!!! I’ll be co-hosting Healthy Vegan Fridays vicariously through Kimmy this week, since I prepared nothing to speak of. 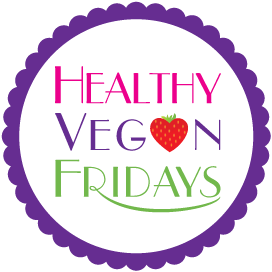 If you’re new to Healthy Vegan Fridays, read all about it here. If you’re already an expert on HVF, then you probably know that you can link back to Healthy Vegan Fridays by using a badge instead of the usual method of just providing a text link. I happen to be fond of scalloped edges, so if you are too, you might like this new badge! I’m not sure how long it takes other people to actually move in to a new house, but I feel so behind! I still haven’t hung my curtains or blinds (I finally persevered through a trip to Ikea AND Home Depot in one day and bought everything, only to get home and realize that in complete opposition to my typecasting of Ikea, there was no wall mounting hardware included in the curtain brackets.) I still have boxes in my garage that haven’t been unpacked. There are still pictures that haven’t been framed and/or hung. And I STILL do not have a dishwasher! My dollhousewarming party is TOMORROW, and I’m soooo not ready at all. Is it too late to cancel it? In all the commotion, I didn’t have time to look at all the recipes submitted to Healthy Vegan Fridays last week. Luckily, everyone else looked at them on my behalf, and the three recipes that the internet loved the most are the following. Next week, in addition to being recognized on these adoring HVF blogs for being awesome, the first place winner will also win an e-cookbook! Check out Kimmy’s page for more information on that since she’s the amazing one who set up the giveaway. I can’t wait to see what healthy vegan recipes you all have. I promise to view them all in a timely manner (after my housewarming party is over). Please use the link below to submit one. And if you have a twitter or instagram account, post a picture of your yummy healthy vegan friday food and tag it with the hashtag #veganfridays.